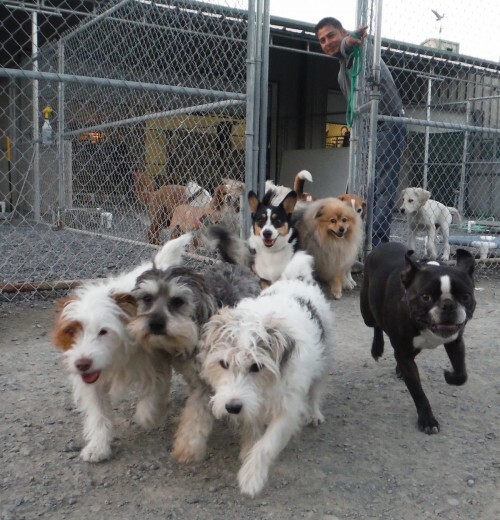 Prior to boarding at Two Rock Dog Ranch, dogs must pass a mandatory evaluation to be sure they are comfortable and safe with a group of dogs off leash. Check-ins only: Please arrive 30 minutes prior to office closing times. 1. Proof of vaccinations and negative giardia test results. Bordetella (kennel cough) – we require this vaccination every six months. In addition to our vaccine policy, we require lab results from an annual giardia test for boarding and day care dogs. You will need to provide your veterinarian with a fresh sample of your dog’s stool. If the test is positive, medication to treat giardia may be prescribed by your veterinarian. Your dog may need to be retested before entering our facility. We require a negative giardia lab result to be faxed or emailed to us annually. We prefer that your vet fax or email your dog’s most recent vaccination records and Giardia test results directly to us in advance of your dog’s visit. Dogs should be on a monthly topical flea prevention program, such as Advantage or Frontline. Please note: All dogs age five months and older must be spayed or neutered prior to entering our facility. Please note: If your dog has not boarded or attended day care with us for one year or more, you will need to schedule an Overnight Evaluation in order to stay during a holiday or other peak time. Dogs receive two meals every day. 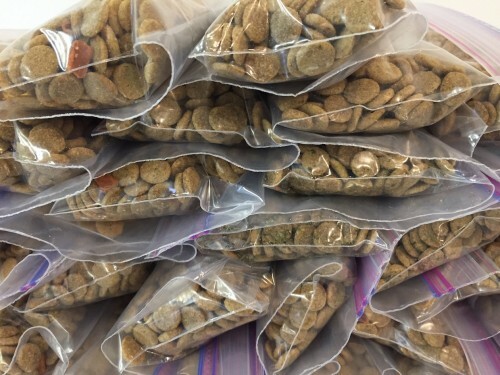 Please provide your dog’s regular food, pre-measured and separated into individual Ziploc-type bags for each meal. You are welcome to bring canned or other food to supplement your dog’s meals. Please include powders and other dry supplements pre-measured in the same bag as the kibble. If you prefer, we offer Life’s Abundance Premium Health Food for purchase ($2 per meal) during your dog’s visit. We ask that you apply a topical flea treatment (such as Advantage or Frontline) to your dog, or give your dog on an oral flea treatment (such as Comfortis tablets) prior to his/her visit with us. If fleas are found on your dog while boarding or attending day care at Two Rock Dog Ranch, we will first bathe your dog to remove the parasites and then apply a topical flea treatment in order to prevent fleas from spreading to our other guests. The bath plus $15 for the topical will be added to your bill. There is a $2.00 daily charge for administering medications.